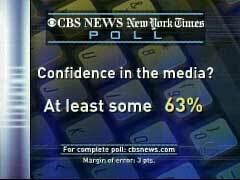 In late January 2006, a CBS News/New York Times poll asked 1,229 adults about their attitudes toward the news media as part of a 'State of the Media' segment on the CBS Evening News. The poll found the public's view of the media divided by partisanship, with self-identified Democrats most confident of the media's ability to report news 'fully, accurately and fairly' and 'tell the truth' all or most of the time, and Republicans expressing much more skepticism. Just over a third of adults (36%) said they had 'not very much' confidence or 'none at all' in the news media's ability to report the news 'fully, accurately and fairly.' Nearly half of Republicans (48%) expressed little confidence in the news media, while three-fourths of Democrats (75%) said they had 'a great deal' or 'a fair amount' of confidence in the media. Three out of five Republicans (61%) said they thought the news media had been harder on Bush than previous presidents. A third of independents (36%) and one out of ten Democrats (11%) agreed. Virtually no Republicans thought media coverage of Bush has been easier than past presidents, but 16 percent of independents and 34 percent of Democrats said coverage of Bush has been softer.